I headed over to Bread Street Kitchen & Bar a couple weeks ago during its soft opening to check out the food with a friend who was keen to see how it fares compared to Jamie's Italian Kitchen. If I had to describe it in a one liner, it would be thus: Bread Street heard complaints about slow service at Jamie's and said hell no, we won't get the same complaints and overcompensated. We ordered an appetizer and two mains for sharing and we were done with the meal within 50 minutes of sitting down. What ended up happening was that we had to deliberately order desserts one after another to ensure that the sorbet won't melt. After the meal, we were given a questionnaire to fill out and one of the questions was along the lines of "Did the server come up to you and ask how the food was within two minutes or two bites of the dish being served?" My immediate thought was to chuckle but then I started wondering if waiters are now actually observing how many bites of food I've had and felt a little creeped out. I apologise in advance for the photos but the lighting was super red and I ended up quickly snapping photos as soon as I spied a waiter walking pass the red lamp so as to minimise the red glare yet it's still not ideal. Unfortunately, with dessert, I could only get horrible photos so I'm not going to post them. Onto the food itself. 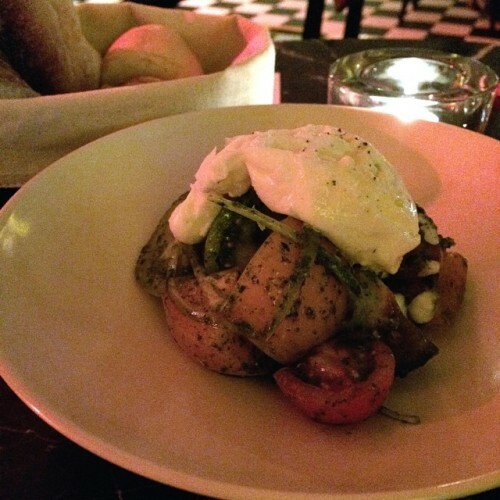 We started with the heritage tomatoes (as they call heirloom tomatoes in the UK), burrata, pesto and shallots. Can’t really go wrong with this combination. The only fault was a rogue underripe tomato that was rock solid hard. 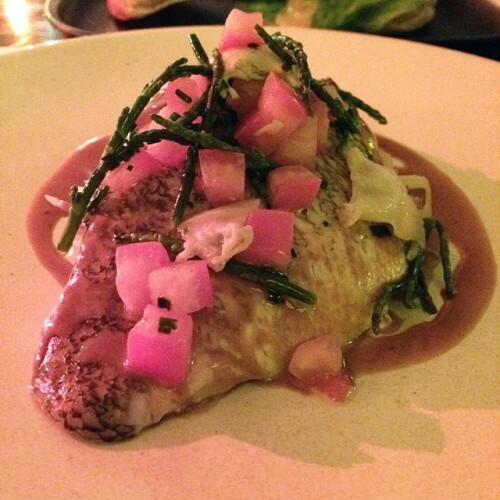 Steamed snapper, braised leeks, clams, sea vegetables, shellfish dressing. The fish was cooked nicely and was a nice mouthful when combined with the sea vegetables but lacked flavour by itself leading us to wonder if the fish was frozen. Didn’t notice clams in the dish at all and only saw that the dish has it now that I am copying from my notes. 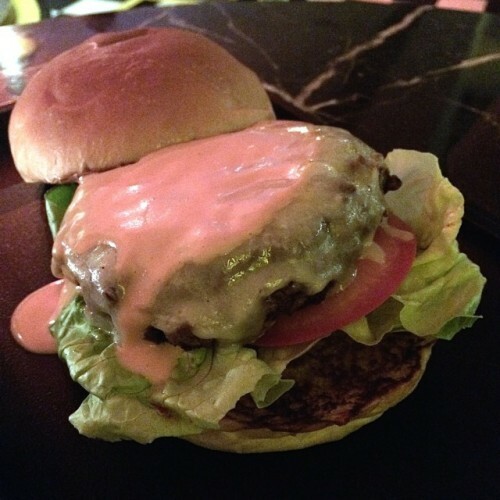 Bread Street Kitchen short rib burger with Monterey Jack cheese and spicy Siracha mayo. Decent burger, however as mentioned, service was so fast that by the time we got to the burger, it was stone cold which was a pity. Finally, for dessert, we ordered the pineapple carpaccio which was nicely refreshing but was essentially sliced pineapples with sorbet and the banana sticky toffee pudding which was gooey and went well with my coffee. Dinner for two (an appetizer, two mains, two desserts, two bottles of water and one coffee) came to $936. 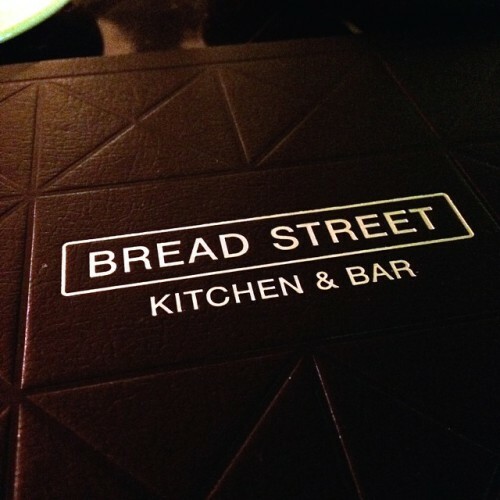 Bread Street Kitchen & Bar officially opens on Sept 18 and Gordan will be making an appearance for the opening. Tel: 22301800 or email Reservations@diningconcepts.com.